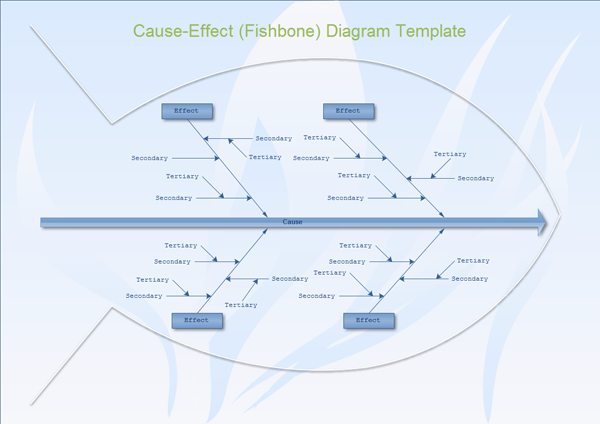 Professional cause and effect diagram software help you create fishbone, Ishikawa, cause and effect diagram from templates and examples. 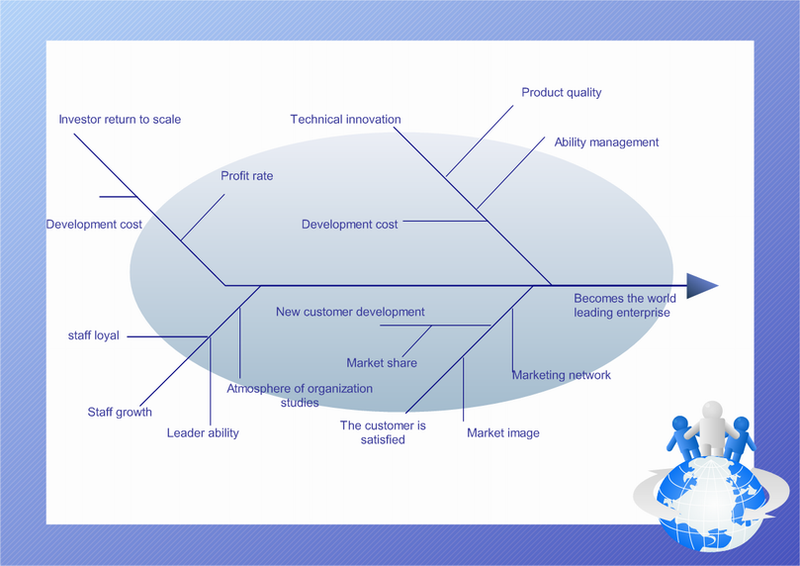 Cause and Effect Diagram helps you to think through causes of a problem thoroughly. Their major benefit is that they push you to consider all possible causes of the problem, rather than just the ones that are most obvious. Cause and Effect Diagrams are also known as Fishbone Diagrams. The box and line can be thought of as the head and spine of the fish. 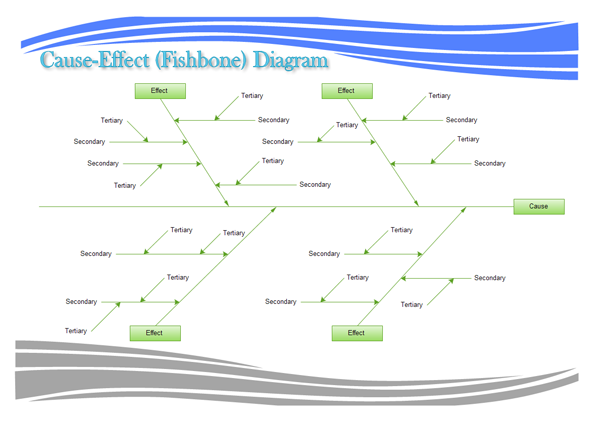 Professional cause-effect diagram software helps you create fishbone, Ishikawa, cause and effect diagram from templates and examples. Cause and Effect Diagram (Fishbone Diagram) provides a structured way to help you think through all possible causes of a problem. This helps you to carry out a thorough analysis of a situation. The example below shows a Cause & Effect diagram drawn by a manager who is having trouble getting cooperation from a branch office. The cause and effect diagram is a method for analyzing process dispersion. The diagram's purpose is to relate causes and effects. There are three basic types: Dispersion analysis, Process classification and cause enumeration. Effect = problem to be resolved, opportunity to be grasped, result to be achieved. It is excellent for capturing team brainstorming output and for filling in from the 'wide picture'. It helps organize and relate factors, providing a sequential view. This diagram deals with time direction but not quantity, which can become very complex and be difficult to identify or demonstrate interrelationships. Write down the exact problem you face in detail. Appropriate identify who is involved, what the problem is, and when and where it occurs. Write the problem in a box on the left hand side of a large sheet of paper. Draw a line across the paper horizontally from the box. This gives you space to develop ideas. Next, identify the factors that may contribute to the problem. Draw lines off the spine for each factor, and label it. These may be people involved in the problem, systems, equipment, materials, external forces, etc. Try to draw out as many possible factors as possible. If you are trying to solve the problem as part of a group, then this may be a good time for some brainstorming! Using the 'Fish bone' analogy, the factors you find can be thought of as the bones of the fish. For each of the factors you considered in stage ii, brainstorm possible causes of the problem that may be related to the factor. Show these as smaller lines coming off the 'bones' of the fish. Where a cause is large or complex, then it may be best to break it down into sub-causes. Show these as lines coming off each cause line. Create cause-and-effect diagrams (also known as fishbone, root cause analysis diagram or Ishikawa diagrams) to systematically review factors that affect or contribute to a given situation. The diagram helps with critical thinking, so you can use it anywhere a causal relationship exists. The more fleshed out your fish becomes, the greater the depth of the brainstorming you have done to understand all of the causes of a particular effect. Create diagrams that illustrate problem-solving, document 6 Sigma and ISO 9000 processes.